The formation of the ‘Council of Tamils’ a new non-political group consisting of civilians of eminence, religious dignitaries, and members of some political parties did not shock many but caused some ripples among the Tamil leaders. The council is spear headed by NP’s chief minister C.V. Wigneswaran with whom TNA’s leadership is at loggerheads on several issues like genocide, international investigation, relationship with present dilly dallying government, etc. The council appears to be generating wide support among Tamils including diaspora and even from some TNA members of parliament. Wigneswaran’s handling of politics as a judge expressing views forthrightly and frankly surely is an irritant to professional politicians in TNA who are now adopting a humble and pleasing approach to the inactive Maithiri-Ranil government which is performing no better than the previous government’s in relation to problems of Tamils and promises made earlier. Wigneswaran plunged into politics as a request of Sampanthan and other well-wishers. 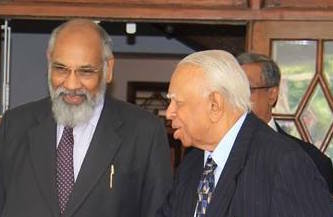 R. Sampanthan was keen to rope in Wigneswaran to strengthen the TNA with a person of high calibre and repute. Vigneswaran becoming an ardent activist found, the opening and has now also become a strong voice for the Tamils, Solely for his unwavering stand and honest politics. Wigneswaran and Sampanthan are now on different routes, and Sampanthan could not succeed in his meeting with Wigneswaran asking him to fall in line with TNA. Besides Sumanthiran, a confidante of Sampanthan openly passed strictures on Wigneswaran without TNA’s backing, which further aggravated the situation all of which exposed the disunity of TNA. The fallout and the formation of the ‘council of Tamils’ became inevitable and many reasons can be attributed to this bold step. TNA right from the beginning has been a divided house, never in one voice when facing or deciding the crucial issues facing the Tamils e.g. questions of international investigation, genocide etc. Sampanthan and Sumanthiran sent confusing and mixed signals differing from other members. Sampanthan’s adamant refusal to register TNA as a political party is a political mistake which he may regret. The larger interest of Tamils should prevail and precede over the interest and image of a party, the Tamilarasu katchi. A single party, TNA with all forming parts of it including Wigneswaran would not have led to the present state of divisions and disunity, allowing for dissenting opinions, statements including personal vilifications in public, thus weakening the cause of Tamils. The beneficiaries are the present government who are excelling in the ‘divide and rule’ policy as usual. Sampanthan is still heaping trust and believing the present government for delivery of a political solution based on federal system in 2016 as called for in the TNA’s election manifesto. The promise of Sampanthan is certain to remain intact and unachievable in 2016 as Ranil and Maithiri have publicly declared that any political solution for Tamils will be confined and within the thirteenth amendment under the unitary form of government. Once bitten twice shy Vigneswaran is no more prepared to believe or trust promises of any government leader e.g. Promises relating to the Tamil prisoners, reduction of armed forces, handing back all the lands seized by the army. Partial handings back of lands which state celebrations is like someone handing over the stolen goods to the rightful owners with public participation and celebrations. TNA’s prodding and plodding without any agenda of action has not only disillusioned Wigneswaran and others in the Tamil council but also the entire Tamils. TNA has thus reluctantly given birth to this new group which also faces tough challenges to achieve its stated objectives. The council has to advance its activities with the backings of TNA and not with any confrontation. Sampanthan has given his blessings for this council provided it does not target TNA or engineer any split. The council is also well advised to keep and maintain a respectable image with members with clean hands and repute. Opportunistic politicians should not be allowed to tarnish and spoil the birth and prevent a rapid growth. The council though it is said to be non-political, question is it will have to make it political to face and deal with parliamentary politicians. However, the council and TNA should have to work shoulder to shoulder without rubbing or trying to out beat or outscore each other for the sake of personal prestige or party interest.